Once a course has been published and required learners have been added, you can view status details about learners in your course. Only required learners with an active enrollment status are included in the course summary details. Learners with a pending enrollment status in courses that are part of a program are not included in the course summary details. On the Courses page, click the name of a published course with required learners. The Course Details page defaults to the Course Summary tab, where you can view the details about learners in your course. Course Summary data is measured quarterly. In the Course Progression Section, you can see an overview of learners' progress in your course. 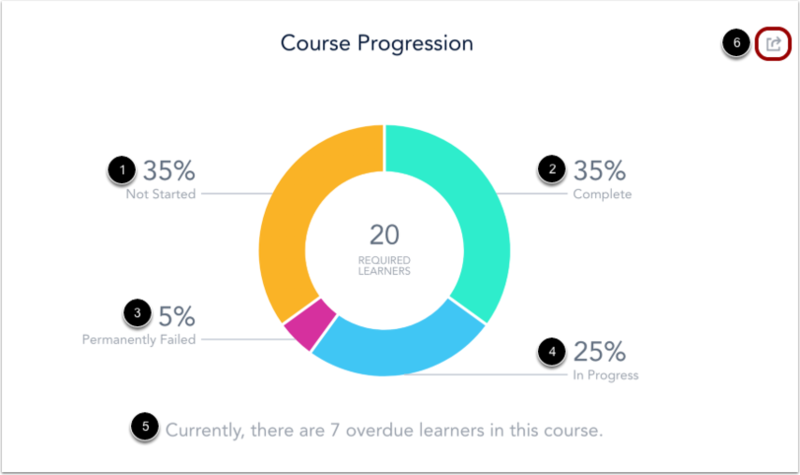 Course Progression displays the percentage of learners who have not started , completed , permanently failed , and are still taking a course . Some courses may have learners who have not completed the course by the due date . To export a CSV file that contains detailed Course Progression statistics, click the Course Progression CSV icon . 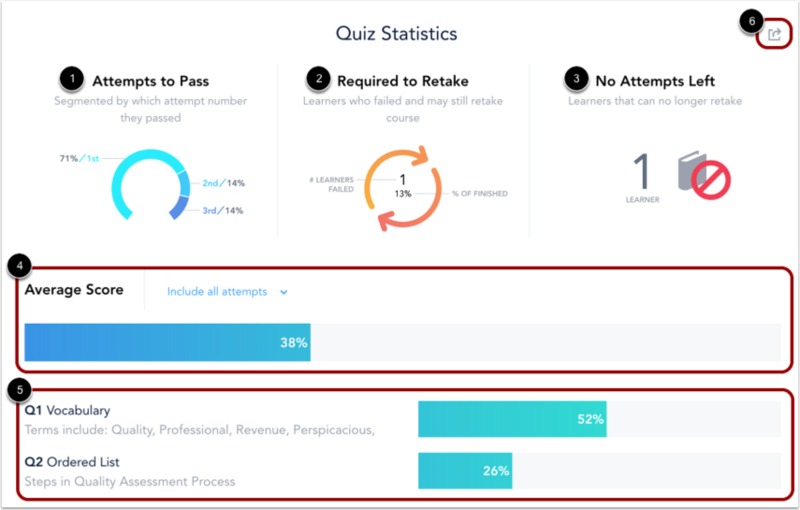 In the Quiz Statistics section, you can see how the learners in your course are performing on quizzes. The specific statistics displayed are: Attempts to Pass , Required to Retake , No Attempts Left , and Average Score . The Average Score statistic incorporates the scores of all the quizzes in the course. You can also see a breakdown of the average score for each individual quiz . To export a CSV file that contains detailed quiz statistics, click the Quiz Report CSV icon . Next Topic:How do I enable Bridge Retain for a course? Table of Contents > Manage Courses > How do I view course summary details?